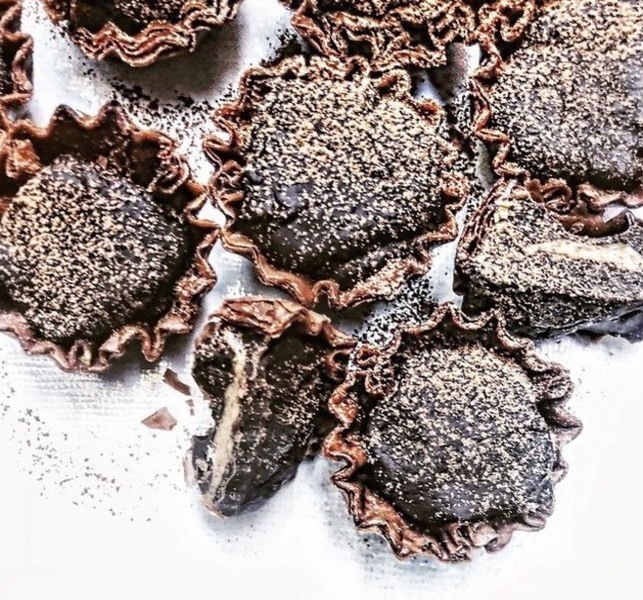 Cure your sweet craving with these dark chocolate almond butter cups. You won’t be able to resist them! Recipe by Jodi Moreno of What’s Cooking Good Looking blog. Melt the chocolate over a double boiler. Spoon about ½ teaspoon of the chocolate into each shell. Allow them to sit on the counter at room temperature while you make the nut butter mixture and keep the remaining chocolate in the double boiler. Mix the almond butter, honey, and powdered sugar together in a small bowl. Then, take about ½ teaspoon of the mixture and roll it between the palm of your hands to form a ball, and place it into the shell on top of the chocolate. Do this until each shell has been filled with the nut butter mixture. Lastly, reheat the remaining chocolate that was left in the double boiler. Spoon another ½ teaspoon over the nut butter, being careful not to overfill. Finish with a sprinkle of flaky sea salt on top, and then place it in the fridge or freezer until the chocolate has hardened. These are best served slightly chilled. 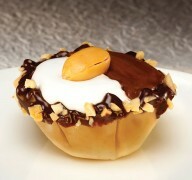 Chocolate pudding, marshmallow fluff and peanuts settle into a crunchy Mini Phyllo Shell in these easy-to-assemble treats.